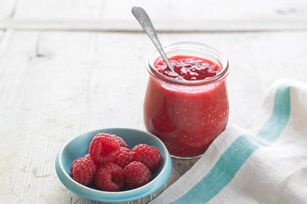 You won't miss the sugar in this sweet-tart raspberry spread. With only 4 ingredients and 15 minutes of prep, you won't believe how easy it is to make homemade jam. Combine ingredients. Let stand 30 min., stirring occasionally. Pour into clean jars or plastic containers; cover with tight-fitting lids. Freeze up to 1 year or refrigerate up to 3 weeks. Crush raspberries; strain through a medium-mesh metal sieve or colander, then measure and use as directed. This recipe makes a soft-set spread. This easy-to-make fruit spread can be part of a healthy eating plan.